FairMail - Blog - FairMail recruiting process – how does it work? Three new photographers have recently joined FairMail – you’ll get to know them soon! – and one of the questions that we are most frequently asked is about the recruiting process. How does it work? Where do we take the photographers? How do we decide who enters FairMail? With this blog post we’ll walk you through the entire process to become a FairMail photographer. Whenever one of the older photographers turn 19, they leave FairMail and therefore there is a vacancy to be filled. We normally work with 10 teenagers, although there are times when we have more and times when we have less. We collaborate with local NGOs and associations that recommend us boys and girls that might fit well in FairMail: motivated, respectful and willing to learn. Having photography skills is not a requirement. Once we have our choice of prospect photographers, we train them for a period of time that can range between one and two months. 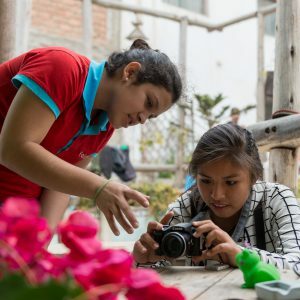 The training consists in free photography classes where they learn the basics of photography and they start familiarizing with their cameras. At the end of the training period the prospect photographers take a theory and a practical test that help us realize how much they have learned. The result of test, combined with an assessment of their attitude and personality give us a clear picture of who can become a FairMail photographer. When the decision is made, the new photographers, together with their families, are introduced to FairMail and they sign the contract that will rule their participation in the company. From this moment on, they embark on a journey of personal and professional growth that will hopefully help them become the adult they want to be.